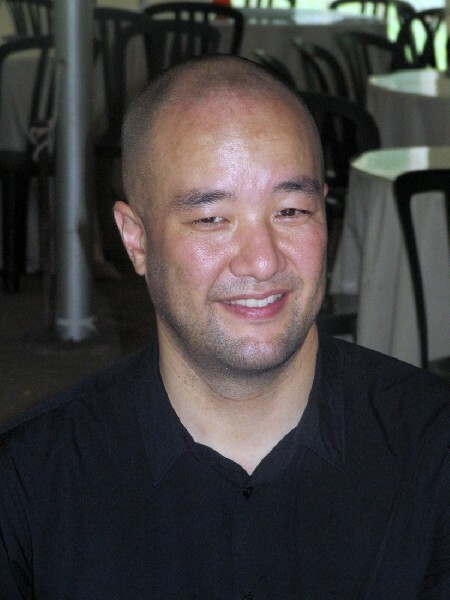 The pianist Art Hirahara performed with Manning. Cedric Hanriot came to jazz relatively late at Berklee College of Music. 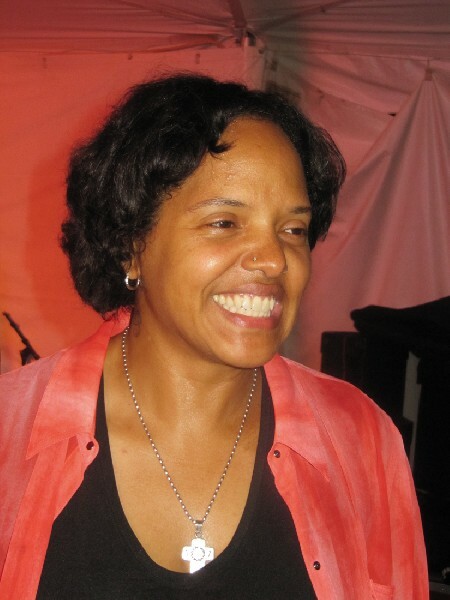 Terri Lyne Carrington started playing drums at age eleven. Renowned bass player James Genus. 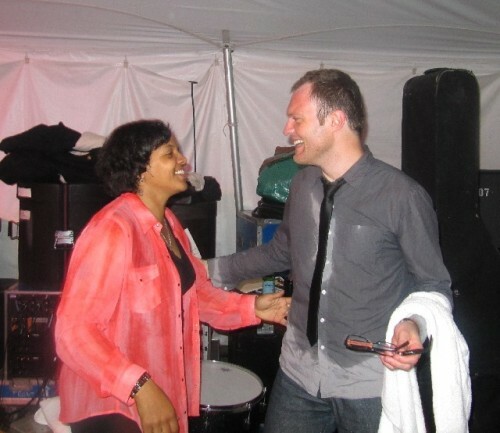 Cedric and Terri interact after a steamy set in the Jazz Tent. 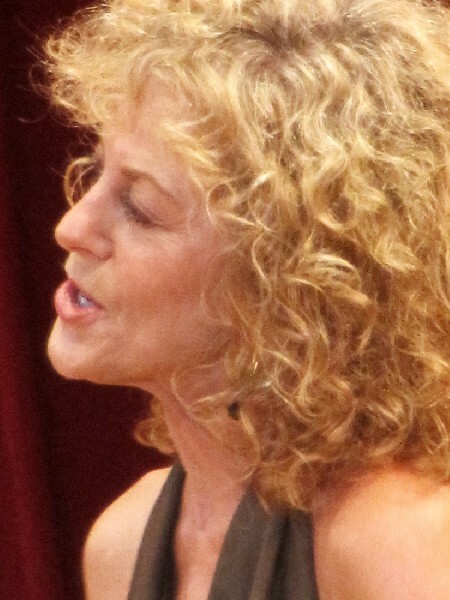 Terri Lyne was the music director for the Sunday night performance of Sing the Truth in Ozawa Hall. 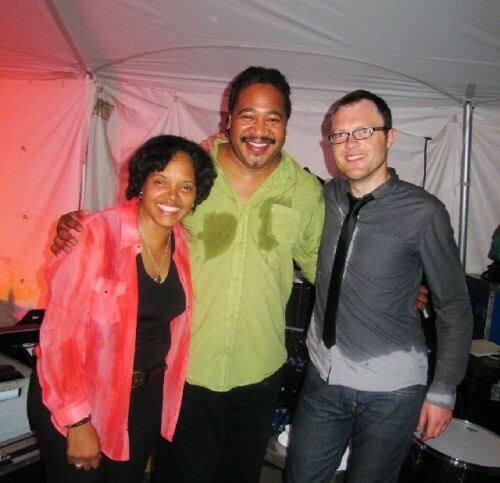 Terri, James, and Cedric cooling off after a hot set in The Jazz Tent. 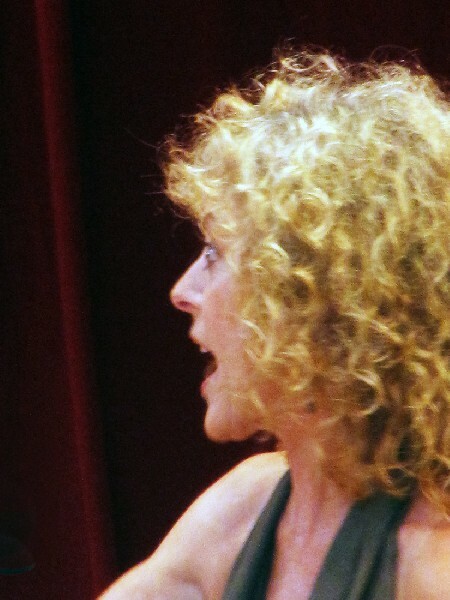 Judy Carmichael and her band performed an easy listening set of afternoon jazz. Carmichael is known for her vintage style of stride piano. Judy in a chin wag with Blythe Danner. Danner recalled her friendship with pianist Bill Evans. Danner thanks the applause of the audience. Jazz critic and historian Bob Blumenthal. Blumenthal conducts a dialogue with drummer Jimmy Cobb and the multi-valent Gunther Schuller. 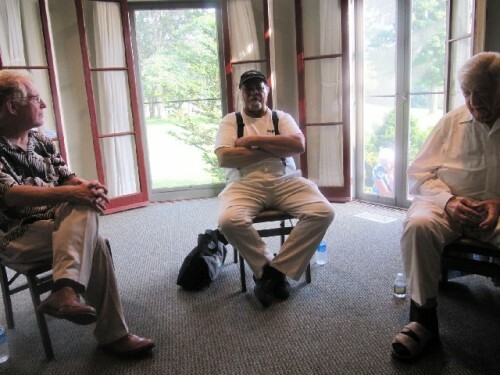 NEA Jazz Master Jimmy Cobb. Gunther Schuller has a long history with Tanglewood. 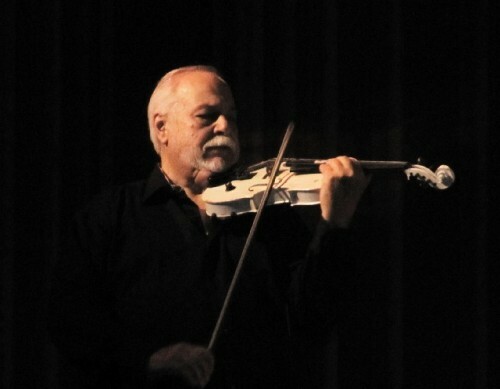 Latin Jazz violinist Frederico Britos. Britos spoke in Spanish of his relationship with the legendary bass player Cachao. Members of the band of Britos jamming with musicians from the John Santos Sextet. Band leader and percussionist John Santos. 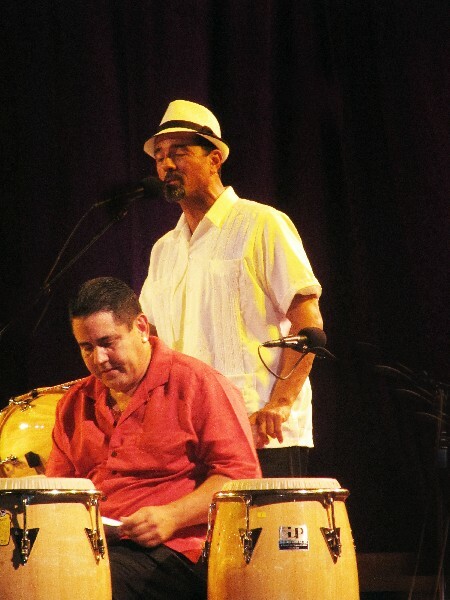 Santos and fellow percussionist Edwin Bonilla. The annual Tanglewood Jazz Festival was awesome. There was everything best about a festival, noon to midnight, from emerging artists to Jazz Masters. Wonderfully organized by Dawn Singh who, unfortunately, was unable to attend. Our thoughts are with her. Jazz and the Labor Day weekend have become a Berkshire tradition. The music is divided between the magnificent acoustics of Ozawa Hall and the Jazz Tent that features emerging as well as global artists. Uniformly performers comment on the thrill and honor of appearing at Tanglewood. It is just as exciting for audiences to hear the best of contemporary jazz in a truly historic setting. While Tanglewood has loosened its tight classical collar, just a bit, there were no jazz artists during high season prior to the departure of the BSO now back home at Symphony Hall. In addition to the cash cow, James Taylor franchise, there were odd pop bookings of Steely Dan and Train. It has been a couple of years since vocalist Tony Bennett appeared in the Shed. Or pianist Herbie Hancock performed last season in Ozawa Hall. Jazz, Blues and Rock are, after all, America’s greatest and most unique musical art forms. During the post war era, for example, the Department of State sent jazz masters including Louis Armstrong and Duke Ellington on global tours. Satchmo cut an album called Ambassador Satch and Ellington recorded his sensual Far East Suite. Sadly young Americans today have little or no knowledge of these great artists or the legacy of jazz and blues. In a time of austerity and cutbacks there is no place for diverse music education in schools. 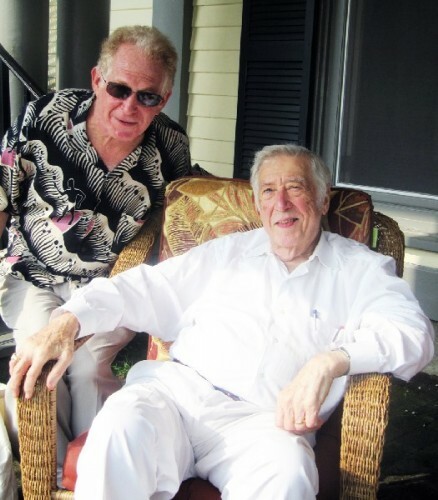 In an amusing aside during an interview with critic and historian Bob Blumenthal, Gunther Schuller, who bridges the gap between jazz and classical music described trying to teach his German father to swing. No such luck. 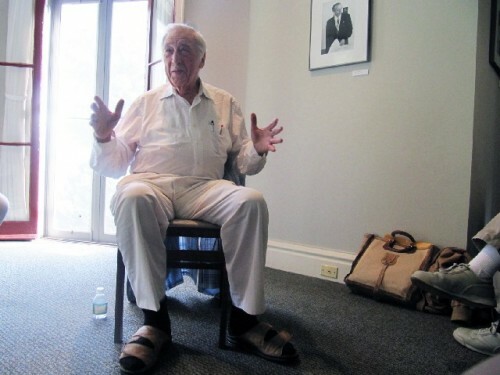 A veteran of Tanglewood the 85-year-old Schuller was on campus to conduct four pieces by Charles Mingus which he managed to reduce from a score for 32 musicians to just 10. More on that later. 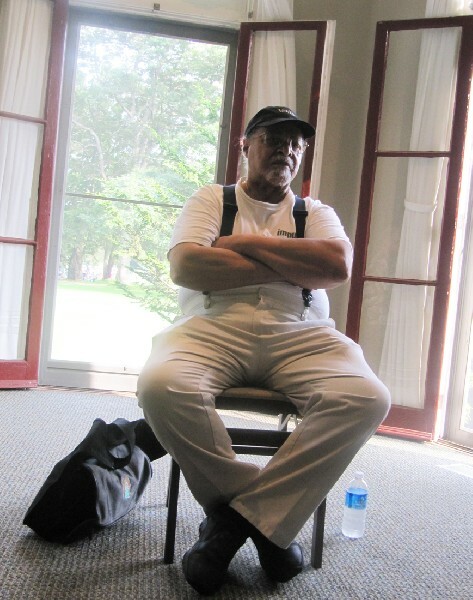 The other NEA Jazz Master was drummer Jimmy Cobb also in his 80s. Still swinging madly. Yet again I had the privilege of introducing acts in the Jazz Tent at noon and prior to the evening concert. It’s my annual show biz gig. This time there seemed to be a sharp contrast between the very young quartet of Sarah Manning and the trio of the French pianist Cedric Hanriot. Manning, an alto sax player, has local roots. 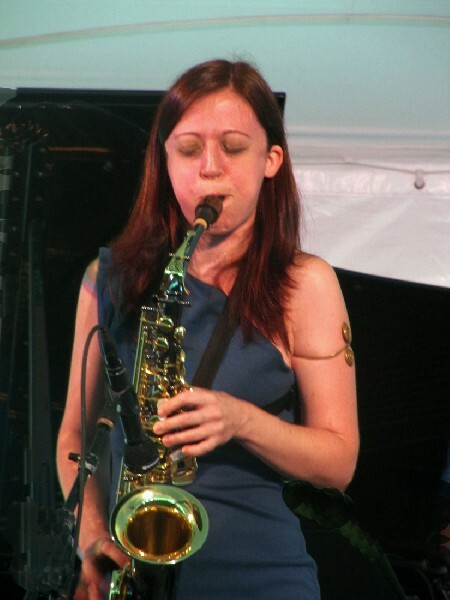 She studied with Jackie McLean during high school and later with Yusef Lateef while at Smith College. She played music from her second CD Dandelion Clock. The group includes Jerome Jennings, percussion, Linda Oh, bass and Art Hirahara on piano. Noting the Berkshire setting she told us of being informed by nature. One work was inspired by the sound of a "Great Horned Owl" while another evoked "Train Signal Gate." She related how three depressing weeks in Savannah resulted in the melancholy "Haversham Street." While the set featured her compositions and straight up hard bop she also offered a cover by Michel Legrand. The song "Windmills of Your Mind" was created for the film Thomas Crown Affair. The notion of emerging artist does not really apply to the French born pianist Hanriot. But he came to music rather late during a scholarship to study at Boston’s renowned Berklee College of Music. His new CD French Stories combines original music and French standards. This was Hanriot’s second Tanglewood appearance, his first occured three years ago with Ben Powell. As he told us he was excited to return to Tanglewood "Under my own name." 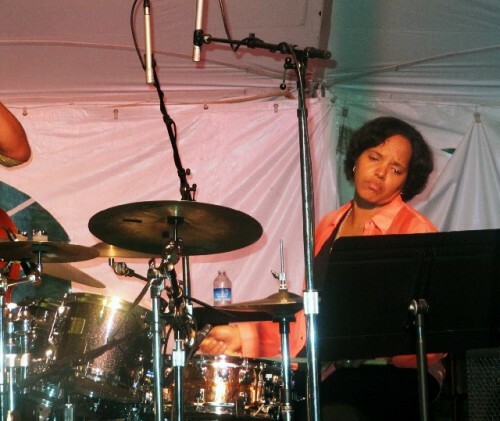 Hanriot had two renowned musicians working with him, drummer Terri Lyne Carrington, and bass player James Genus. From the first note they were flat out in a tough and funky groove. You wondered when they were coming up for a breath. 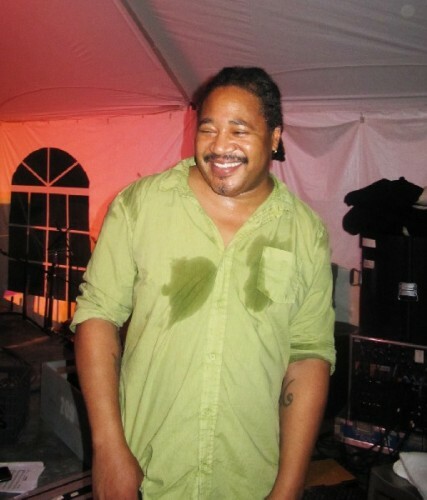 Cedric performed with a Steinway and an electric piano sometimes with one hand on each keyboard. The hour long set was mostly a slammin jam. 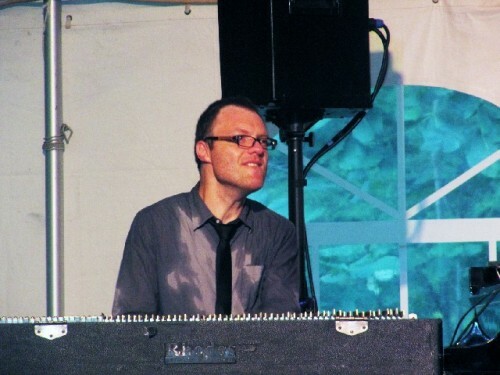 In the humid summer air Hanriot was soaked through as he channeled amazing energy into the playing. Among the works performed were "Tribal Poem" and "Louisiana." It is music that demands more time to absorb. Let’s hope that we have more opportunities to hear this superb musician. It was great to see Carrington now quite grown up. I reminded her of catching her at Sandy’s Jazz Revival in Beverly when she was 13. “A blast from the past” she responded. “Actually I was eleven.” She and Genus were the accompanists for the spectacular Sunday night program Sing the Truth with Angelique Kidjo, Lizz Wright and Dianne Reeves. The Jazz Tent provides vital exposure to artists. It is where we first heard the sax player Grace Kelly who will appear in October with sax player Phil Woods at the Colonial Theatre. 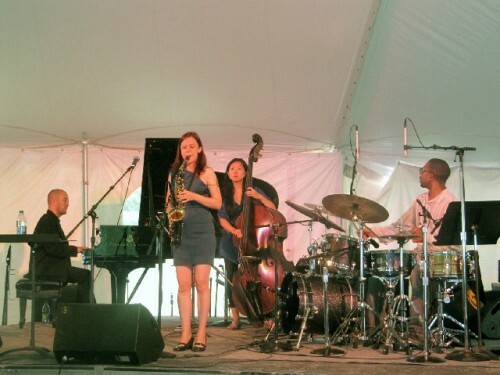 It is a part of the annual Pittsfield Jazz Festival organized by Ed Bride. A few years back the Peruvian harp player Edmar Castenada tore up the Tent. He was later featured in Ozawa Hall and returned to this festival appearing with the Mingus orchestra to perform the Mingus intro to his "Haitian Fight Song." 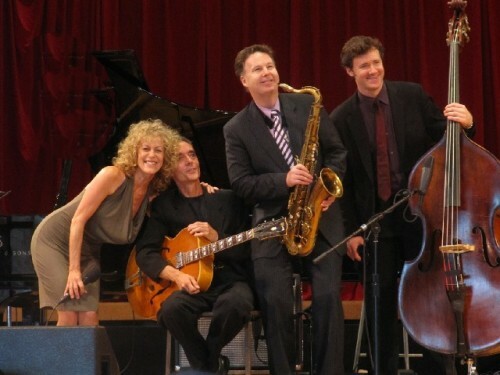 This year Tent alumni the Robin McKelle Quartet and Michael Keshammer Sextet were featured Friday night in Ozawa Hall. 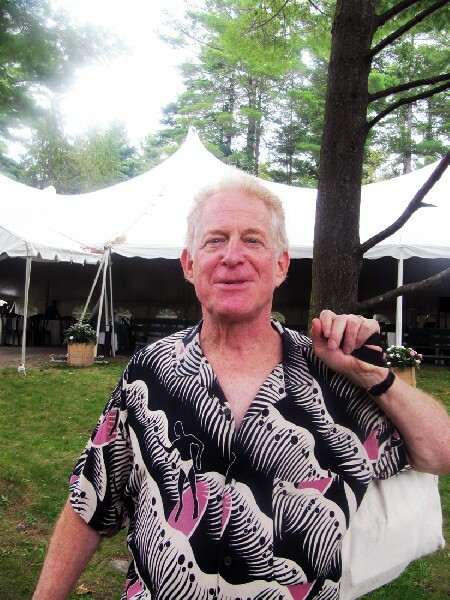 There is a Tanglewood Jazz Festival tradition of Saturday afternoon live radio broadcasts. It started with pianist Marian McPartland. For the past couple of years Radio Deluxe with John Pizzarelli and his clan were featured. This time we heard stride pianist and singer in a broadcast of Judy Carmichael’s Jazz Inspired. She was accompanied by tenor saxophonist, Harry Allen, and guitarist Chris Flory. 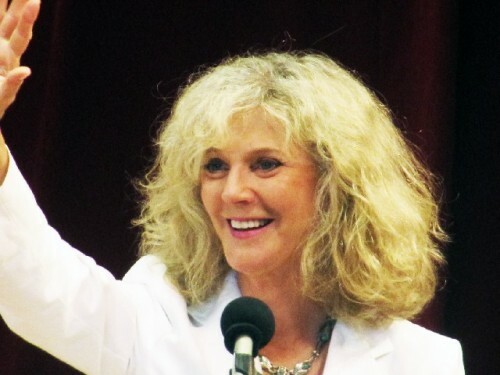 The special guest was the actress Blythe Danner recalling her college years when she sang in a group with Chevy Chase. She brought along pianist Mike Renzi and Neal Miner. The norm of these Saturdays at Tanglewood are for what Astrid has dubbed “afternoon jazz.” That describes a form of light and easy patter combining charm, a couple of tunes, and celebrity chatter. Carmichael has tons of charisma and personality. She plays a mean stride piano, as demonstrated on the Fats Waller tune “Honeysuckle Rose,” but her singing is a tad under adequate. She chatted up Danner mostly about her time at Williamstown Theatre Festival, anecdotes about daughter Gwynyth, and her love of jazz. That turned to her great admiration and friendship with pianist Bill Evans. In a stunning interlude the pianist Renzi performed an evocative rendering of the Evans classic "Waltz for Debbie." For the occasion, protesting that she had a cold, Danner gamely sang a Blossom Dearie classic “Peel Me a Grape” by David Frishberg. After an intermission Danner channeled Shelia Jordan’s “Falling in Love with Love.” They swung through a duet of "I Can’t Give You Anything but Love.” The dames was game. When the afternoon concert ended we attended the Blumenthal interview with Schuller and Cobb. It provided insight and background for the Sunday afternoon concerts. During the Q&A I asked about their work on the famous Miles Davis recordings Birth of the Cool (sessions 1946-1949) and Kind of Blue (1960). They offered fascinating insights that will form a sidebar of our Festival coverage. The evening program in Ozawa Hall featured the jazz violin of Federico Britos with his sextet and percussionist/ composer John Santos. They offered a tribute to the Cuban bassist Israel Lopez (1918-2008) who was known as Cachao. The classically trained musician was a legend of Latin Jazz and credited with the invention of Mambo. 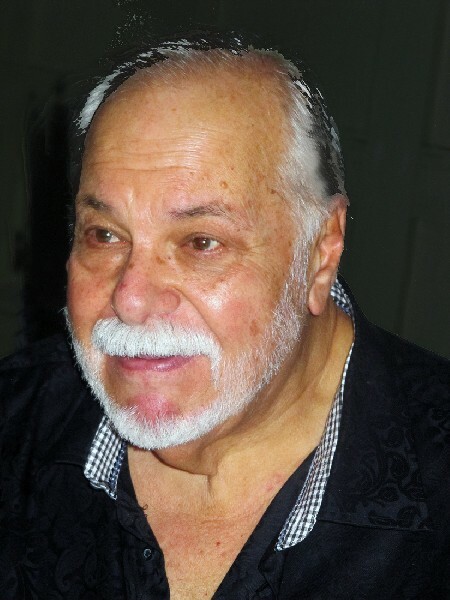 He played the acoustic bass with his late brother, multi-instrumentalist Orestes López. The brothers composed literally thousands of songs together and were heavily influential on Cuban music from the 1930s to the 1950s. 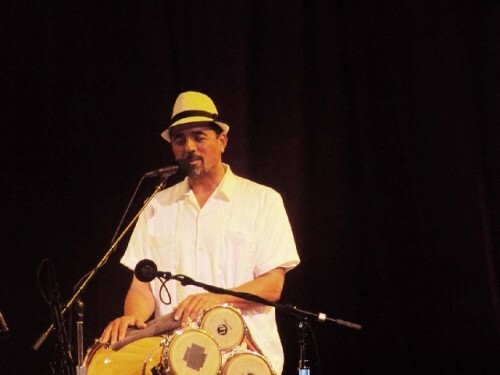 They introduced the nuevo ritmo ("new rhythm") in the late 1930s, which transformed the danzón by introducing African rhythms into Cuban music, which led to mambo. They co-wrote the danzon "Mambo." In 1957, Cachao gathered a group of musicians in the early hours of the morning, energized from playing gigs at Havana's popular nightclubs, to record. The resulting descargas, known to music aficionados worldwide as Cuban jam sessions, revolutionized Afro-Cuban popular music. Under Cachao's direction, these masters improvised jazz combined with Cuba's popular music. The sessions were released in 1957 by the Panart label under the title Descargas: Cuban Jam Sessions In Miniature. Britos opened with the jazz standards “I Got Rhythm” and Duke Ellington’s “Perdido” followed by an original “Buon Aventura.” His musicians included Felix Gomez, piano; Jorge Garcia, guitar; Ranyel Rivero, bass; Carlomagno Araya, drums, and Edwin Bonilla, percussion. At the end of the set Britos invited members of the John Santos sextet to join them. They jammed on “Cachita.” During his set Santos returned the favor for a stunning performance of Mambo Kings. The San Francisco based Santos appeared with John Calloway, flute; Melecio Magdaluyo, flute and tenor sax; Marco Diaz, piano; Saul Sierra, bass; and David Florex, drums. During a sobering interlude Santos decried the fact that some 31 categories-including Latin Jazz, Cajun, Zydeco, and Native American- have been dropped from the annual Grammy Awards. He urged the audience to tweet and if there is no response to boycott the annual Grammy broadcasts. The performances richly demonstrated the importance and vitality of Afro Cuban jazz traditions. The musicans sizzled in a tribute Cachao as well as "Tata y Cuchin," "A Gozar con Mi Combo'" and "Israel y Aristides." Britos speaks no English but made passionate remarks through an interpreter. Santos added to the dialogue as we learned a lot about the legendary Cachao and the vital heritage of his contributions to Mambo and Latin Jazz. It evoked the confluence between high art and popular music. Some audience members just couldn’t stay put and burst to their feet to dance with the Salsa beat. For me it was Hey Mambo, Mambo Italiano. Viva.